Wouldn’t you love to know the tricks professional retail designers and planners use to the most of your space? Free of charge. “Your brand [read: your store] is a story you tell to the world with the hope that it will resonate, and consumers will want to associate themselves with your brand,” says Adrienne Weiss, the designer behind stores like Build-A-Bear and Baskin Robbins. And there are a handful of clever and sure-fire and profitable tactics that professional retail designers employ that could help any retailer up their game when it comes to customer engagement and management. So, let’s explore some of the techniques most used and under-appreciated. Many of these tricks and tips can be seamlessly added to your retailers’ handbook. A secret sauce of sorts, we’ve lined up six insider strategies that you’ll typically only learn from the professionals for a fee. Concepts that will improve your retail environment, customer experience, and selling opportunities. Let’s start with the obvious, but also often overlooked: something as simple as making sure your windows shine with some spit-and-polish is dead-easy for starters. Then ensure that your window displays are appealing; that they tell a story and revolve around a single thematic colour. It’s important to avoid a cluttered/overcrowded look because a sense of space will signify that feeling of luxury. Once inside the entry-way area, also called a decompression zone, you’ll want to present an open, inviting and easy to navigate space. Its purpose is to give shoppers a chance to transition from the parking lot/mall/outside world and refocus on shopping. Size for the decompression zone will depend upon the size of your sales floor, but it’s generally the first 5 to 15 feet inside the front door. Remember, first impressions are lasting impressions. An eye-catching store-front display is paramount. As shoppers walk in the front door, they should be attracted by merchandise, not repelled by checkout counters or other service elements including baskets and carts, which should be kept clear of your decompression zone. Tucked off to the side will help shoppers find and grab them as needed. Nothing within your store-front display should be so tall as to block the sightlines of the store and certainly not so crowded as to create an overwhelming experience. Try something seasonal, touchable, or tryable for interest-sake. For your decompression zone, avoid too many products or signs. The first thing shoppers will notice inside your store is your décor package (walls, flooring, primary and accent colours, fixturing, signing, wall striping) which must work together to tell a single story. PICTURE THIS: Décor and signage are two language elements that tell your store/brand story. They encompass the whole as if an onion skin, while shoppers peel back the layers of that onion, moving from the entrance to department, from department to category within a department, from category to a product line, shelf level browsing, detailed examination of features and benefits of items, all to make that crucial buying decision. Odd as it may sound, be sure to steer shoppers to the right. Yes, customers will look left then right, but prefer to move to the right through a counter-clockwise direction around a space (says Brian Dyches, chief experience officer of retail branding firm Ikonic Tonic, Los Angeles). Customers will move just past your decompression zone and look to the right at the wall commonly known as the power wall. This is another one of those key merchandising areas, first and foremost because it’s the wall shoppers see first after turning right making it a useful perception builder. Therefore think logo, corporate colours and thematically displayed merchandise. The Grid-Street Layout: where fixtures run parallel to the walls, customers typically grab a shopping cart and start in a front corner walking each and every aisle. Benefits are clean sight lines throughout the store and maximum end-feature exposure. The best examples of this layout are grocery or big-box stores. The Loop (Racetrack) Layout: offers a clearly-defined main aisle that circles through the store like a race track with perimeter fixtures running perpendicular to the wall, and center fixtures running parallel to the side walls. Benefits are the ability to send shoppers to the right and maximum product exposure using perimeter walls. The best examples of this layout are Target or Best Buy. The Free Flow Layout: is used by specialty stores because it allows for the most creativity with no set aisles or straight lines. Benefits are angle-placement of fixtures to encourage shopping, more opportunities to romance the merchandise and create lifestyle display vignettes. The best examples of this layout are fashion and apparel stores or automotive dealerships. It’s important to create breathing or white space to allow the eye to rest/relax. So, from just past the decompression zone, you can utilize the placement of fixtures in what is known as speed bumps. These merchandise displays work much the same way as speed bumps in parking lots by slowing customers down. They can also grab attention and introduce/feature cool products. Specialty fixtures such as slat board 4-ways or small display tables for seasonal or new items can make great Speed Bumps. NOTE: Be sure to rotate the product on your speed bumps at least once a week. TIP: Your front right corner is not the best checkout location! It should be located at a natural stopping point in the shopping experience; perhaps the left side of the store and close to the front. Be consistent with branding (for impact). Use signage for memorable, enticing first impressions. Spread your logo around and accent with a colour theme generously (preferably your corporate/brand colours) because colour equals feelings. SIDEBAR: There are two kinds of colours used in store décor: Primary colours (neutrals) and secondary colours (bold, accent colours). Primary colours are used in 80% of the store’s décor to create a relaxed atmosphere for customers’ shopping. Accent colours, 20% because they are the attention grabbers. Not only does lighting create visibility, but it also contributes to the mood; think moody, edgy, playful, relaxed, energized, or mysterious. Mirrors can increase that expansive feeling of space and help bounce that light around. Also, a glass or acrylic components in your displays can help achieve an open and airy or backlit effect. Utilizing music and scent (but be aware the scent-free movement may prefer a scent-free zone) to create ambience. Use the checkout area for impulse merchandise. Update your displays regularly. If you are lean on inventory, make sure to push product to the front of the shelf to make it look neater and more fulsome. In your window display, product displays, or point of sale location, using the colour green has been shown to increase customers spending by 25%. Plants create the most appealing sense of green for humans, so perhaps a living wall is your answer! Cutting back on plastic packaging and bags or offering an email receipt? Then to save that other form on green ($), turn things down or turn them off. Consider putting timers in under-utilized spaces such as storage areas, washrooms, change rooms. And shut down those ‘power vampires’ like computers, cash registers or other electronics for the night. As a retailer, you need to stretch your budget to cover your vision. That means understanding where best to spend your money and where to save it. The premier retail designers know just how to tip the game in your favour by implementing some easy tactics – that almost effortlessly add to your bottom-line. 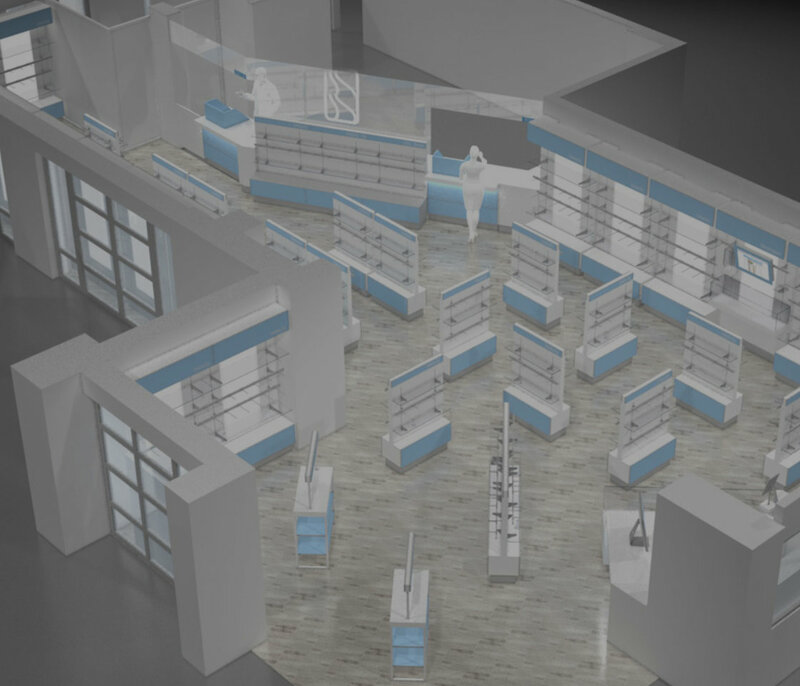 Of course, if you’d like help with your next store design or space planning, our in-house design and engineering team is ready to help. Just give us a call. It only takes a few seconds to sign up for great articles on industry trends, growing you business, retail design, and custom fixtures.